I don't know if people actually deal with grief in five stages, but I've always done it in two: depression and acceptance. I really commit to the sadness, too. I lock myself up for a good week, let the woe take me to the places it wants to show me, and I make sure to get a good look. Eventually I work my way to my near-ornamental piano. I'll revisit Chopin, Beethoven and show tunes. Sometimes the disappointment of my rustiness adds volume to the misery, which isn't uninvited. Giving in somehow makes it go away. Music is an extraordinary language for sorrow. There's wailing, and then there are pieces like the "Lacrimosa" from Mozart's Requiem that capture the essence of wailing with ghostly accuracy. It recalls exactly where your most primitive wail came from and extracts it from your bones. Movies about classical music composers tend to get bogged down by biographic details, but Tous les matins du monde would rather fictionalize real people to let the haunting soundtrack tell its own story. 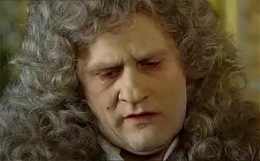 The film is about a brilliant Baroque musician who lets his anguish call the shots. It's also about his student, who, in his final moments, realizes he was dead inside. The most captivating character is the mesmerizing score, which steers the movie's textured emotional climate. 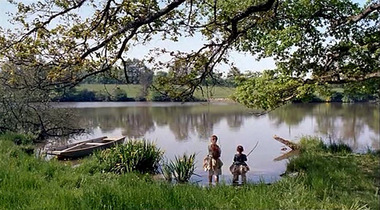 Every scene has the solemn aesthetic of a Baroque painting, whether dimly lit like a Rembrandt portrait, crisp as a Beert still life, or with the balanced blur of a Lorrain landscape. The movie - itself a long, uninterrupted flashback - is anchored in the past like its characters, who yearn for everything they've ever lost. Music lets them be in the now and live in the long-ago all at once. "Every note must end in death." 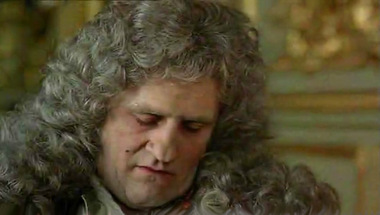 Tous les matins du monde begins with an unforgettable close-up of a snoozing Gérard Depardieu, looking decadent and tattered in a 17th-century wig and crusted makeup. He plays French court composer Marin Marais, whose dronish "Sonnerie de Sainte Geneviève" is playing in the background by an unseen orchestra. Marais wakes up and gives his chamber a cryptic critique: "Every note must end in death." Neither the clumsy conductor nor the orchestra understand what he means ("Hold yourself back just as you're about to finish the note off"), so Marais lashes out. He orders everyone to sit down, be quiet and listen to the story of the recently deceased Monsieur de Sainte Colombe, his viol master. It starts with "I'm an imposter." The viol is somewhere between the viola and cello in size, but with 6 strings and a flatter bridge, so the bow can play both single notes and chords. Legend has it that Sainte Colombe, played by the sublime Jean-Pierre Marielle, added a 7th string to the bass viol to give it a more full-bodied sound, which the film isn't too shy to demonstrate. When his wife dies, Sainte Colombe composes a viol opus called "The Tomb of Sorrows." Though he's a man of prodigious talent, Sainte Colombe is also irrational and anti-social. He cuts himself off from the world after his wife dies, refusing to even play in the King's court. Oddly, his social ineptitude makes up most of the movie's funny moments. They're not big laughs, mind, but they're appropriately timed chuckles, and moderately frequent in the first half. 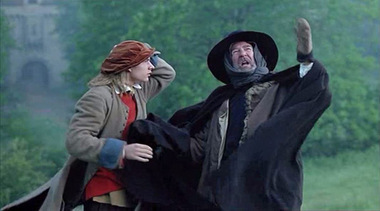 In one of them, Sainte Colombe tries to comfort his daughters after the youngest, Toinette, is startled by a nightmare. He bursts into their room, inelegantly pats the bed while humming a tune, and abruptly tells them, "I'm no good with words, but I love you both. Now that's enough." It's fitting that Sainte Colombe plays a stringed instrument, since the sound is said to be closest to the human voice. Holed up in his shed with his viol, some wine and a few wafers, he plays pieces from the "Tomb," communicating in the only language that he feels makes any sense. As he does, his wife appears to him. Is she real or a hallucination? He doesn't care. If music can bring back the dead, play on. "He didn't want to be a shoemaker." One day, young Marin Marais (played by Depardieu's son, Guillaume) appears on Sainte Colombe's doorstep. A musically inclined shoemaker's son, Marais had to leave the church choir when his voice cracked. He's forced to return to his father's workshop, but he can't stand the constant hammering and the stench of urine, so he decides to pursue music. Turning to the viol, he quickly outranks his teacher, who sends him to Sainte Colombe to complete his training. "I want to become a famous violist," Marais proclaims. This makes Sainte Colombe reluctant. He's never had any use for fame, but he feels for Marais's cracked voice story. So he takes him on without warning Marais that the going won't be easy. "You'll make music, but you won't be a musician." Sainte Colombe doesn't mince his words with his apprentice. He predicts Marais's eventual position in the King's court, but he doesn't believe his student understands what music really is. He tries to show Marais how to find music in tears, in the brush strokes of a painter, in the howling wind, in the thing that happens before it even has a sound. But Marais's ambition is tantamount to blindness. In a fit of rage, Sainte Colombe destroys Marais's viol. "This instrument isn't even music," he tells his baffled pupil. Sainte Colombe asks Marais not to return, but he does because he's having an affair with Madeleine, the eldest daughter. She offers to show Marais everything she's learned from her father. Whether Marais is genuinely enamoured or simply opportunistic is never clear. He uses his time with Madeleine to sneak under Sainte Colombe's shed and observe his technique. Eventually, and somewhat inevitably, Marais gets high enough in the court's pecking order to feel like Madeleine's old news. He leaves her, not knowing she's pregnant. "Music speaks where words fail." The dialogue in Tous les matins du monde is rather scant, which is fitting of Sainte Colombe. His grief over his wife intensifies his devotion to music because his compositions say what he can't. In the same way, Madeleine, who succumbs to a deadly depression after giving birth to a stillborn baby, only wants to hear the little ditty Marais composed for her called "The Dreamer," back when she used to inspire him. The final confrontation between the old lovers is anything but friendly. As her father might have done, Madeleine calls Marais on the fact that his love for her couldn't trump his desire for the court. Marais makes feeble excuses, but she just wants him to shut up and play. The movie's title comes from a line in Marais's narration: "All the mornings of the world never return." It's loaded with significance, both in the movie and in general. Regret means wanting to take it all back, which is impossible. But that doesn't mean we can't be redeemed. There's a beautiful moment at the end when, in their last encounter, Sainte Colombe asks Marais if he finally understands the purpose of music. Marais naively says "God." He's wrong, because "God can speak." Sainte Colombe makes him try again, and Marais goes through an exhaustive list of guesses: love, the loss of love, silence, glory...But he still doesn't get it. Marais begins to well up, admitting he doesn't know. Maybe it's better left to the dead. Sainte Colombe lights up. "You're getting warmer." This prompts Marais's epiphany: "A little tune for those who can't speak any longer. For lost children. For softening a shoemaker's hammer. For the time before we even lived or breathed or saw the light." We can't return to these moments physically, but music can take our minds there, and it'll take us to a very specific spot. It's not reliving the moment. It's more like you never left, holding it captive despite the cruelty of time. Tous les matins du monde owes its score to Jordi Savall, one of the few violists left in the world. It's not that it's a terrible instrument to play so much as composers stopped writing for the viol after a certain point. If you choose to specialize in the viol, you'll mostly be limited to performing Renaissance and Baroque music. 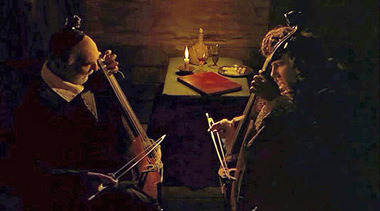 What Jordi Savall demonstrates with the movie's score is that playing an archaic instrument does not limit musicality. Savall had to take on the personality and style of the characters when he played each piece. As Marais, he's light and springy, but essentially lacking any emotive quality. When he's Sainte Colombe, he's morose, deliberate, and sustains notes with a palpable gravitas. Few pieces in the soundtrack are more poignant than "The Tomb of Sorrows." You can even hear Savall taking deep breaths as he plays. Every phrase is a phantom tear, arms reaching out for vanished things. It's what regret would sound like if it could make a sound. Olivia Collette is from Quebec but is living in Spain this year. She tweets as @olivia_collette and blogs at Livvy Jams.